Dig out your old Apple Airport Express and you can reconfigure it to make it an AirPlay 2 streaming target and stream music to any speaker you can hook up to it. AppleInsider digs one out. This is why we hang on to our old Apple gear. The AirPort Express hasn't seen any development in half a decade and Apple discontinued it this year. But, with Tuesday's firmware update, these devices can now be used with the latest AirPlay 2. So dig out yours and prepare to do just the very tiniest amount of fiddling. So many devices come with their own built-in Wi-Fi adaptors but there are still printers, games consoles and sound systems that don't. As long as they do have either an Ethernet or a USB port, though, you can give them 802.11n Wi-Fi by plugging them into an AirPort Express. You do lose one thing, though Once your AirPort Express is set up this way, it can't be used as a router. Instead of having your internet line hard-wired into the AirPort Express which then shares the signal out over Wi-Fi, you're hard wiring the sound system in. Consequently, there's no point doing this at all if you're still relying on an AirPort Express as your Wi-Fi router. However, if you were still doing that, you should definitely upgrade. AirPort Express still uses the 802.11n standard where modern routers are on 802.11ac. Ignoring what these two standards promise, in practice 802.11in gets you less than 15 percent the speed that an 802.11ac router does. If that doesn't get you ripping your 802.11n AirPort Express out then it's because you probably already have. Either way, you now have, or are soon going to have, a spare AirPort Express and this is what you do with them. As a species, we don't tend to print out as much as we used to but we can't get rid of printers yet. So if you've still got a USB one, consider taking yours off your Mac and plugging it into an AirPort Express instead. That way every device in your place can print wirelessly to it. With print jobs you don't really care how long they take. You don't want them to be slow, but a few seconds either way doesn't make a difference. With audio, it does but even these slow AirPort Express units are compatible with AirPlay 2. 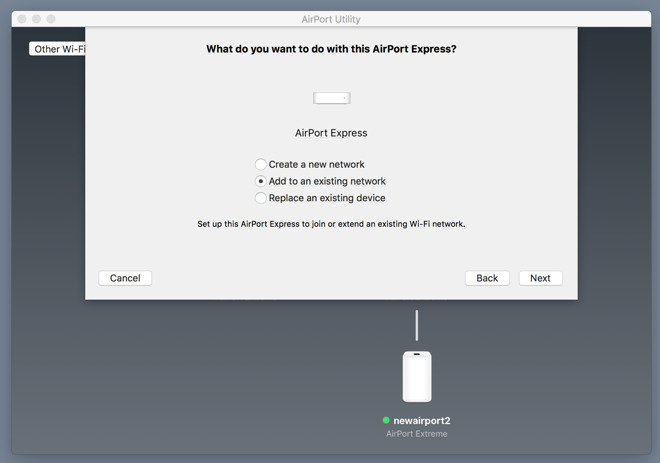 Plug in the AirPort Express, and let it boot. 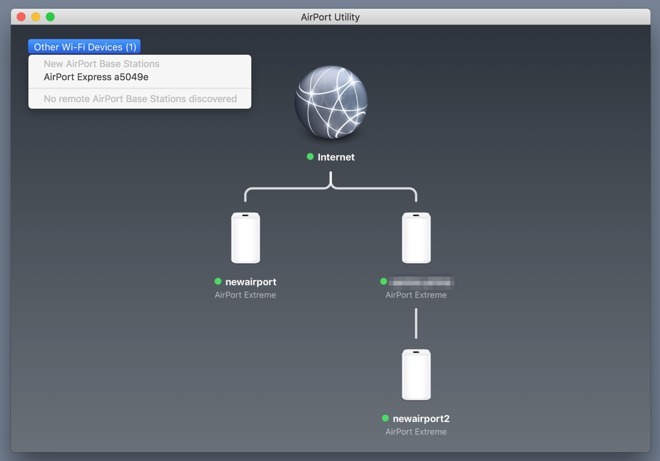 Once it's running, connect your speakers, your printer, or both into the AirPort Express, and launch AirPort Utility on your Mac. If you already have an AirPort Express configured then it will show up on this map. Check that it has the latest firmware. If the dot next to the name is green then you're fine. If it's yellow, then you don't have the latest but there will also be an Update button. When you've got the latest firmware installed, then take the AirPort Express back to basics. Select it, then in theBase Station menu, choose Restore Default Settings. Next, click on Other Wi-Fi Devices. It looks like a button but it's really a drop-down menu that will list all the AirPort-compatible devices that the utility can find either on Wi-Fi or Ethernet. Select the Base Station and the Utility will take a bit of time to gather information about it. When that's done, you'll have a screen that includes an Other Options button at bottom left. Click on that and you get options such as creating a new network or replacing an existing device. There will also be Add to an existing network. Choose that and click on Next. Choose your Wi-Fi router in question of any make and model, enter the password if prompted, and you're done. Your non-Wi-Fi-enabled device, or those speakers you love, are now on your Wi-Fi network. What's more, they're on your network and because you have the latest firmware, they are immediately able to benefit from AirPlay 2 without you doing anything else. 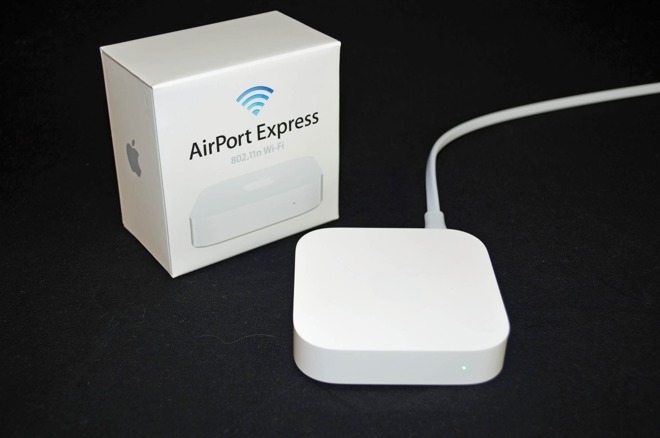 Although supplies are dwindling, shoppers can still get their hands on an AirPort Express Base Station at Adorama for $95 with free shipping and no tax collected on orders shipped outside New York and New Jersey.